Any hardware hacker will tell you, a significant other who embraces your passion is a keeper. [Nathan] found a keeper in [Jessica] – they even worked together on a hardware hack for their own wedding. The couple wanted an interactive element for their guests. Disposable cameras are getting a bit hard to find these days, so the solution was a trivia powered lock box designed and built by [Nathan] himself. Guests arrived at their tables to find locked boxes and cards with trivia questions about the couple. Only by answering the questions correctly would they unlock the box to access the prizes inside. Each box consists of a Really Bare Bones Board, which is essentially an ATmega328 breakout board. The user interface consists of five tactile switches and a 16×2 character based LCD. The box is a clear Vaultz pencil box (Yes, the same brand Ahmed used for his clock). The final element is of course the locking mechanism. One of [Nathan’s] friends noticed that the Vaultz box latch was riveted in, and was spring loaded. It only took a bit of work to flip the latch from the outside to the inside. Cheap 9g micro servos from the far east pull the latch open with a string. The only thing we haven’t figured out is how [Nathan] closed the latches while they were inside the box. Obviously some black magic was involved! [Jessica] decorated the box with circuit traces created on her vinyl cutter. On the eve of the big day, [Nathan] realized that his tactile switches were… not really switching. The superglue he had used to mount them had seeped into the switch body, freezing it solid. Nathan saved the project with a herculean effort of soldering 5 switches on each of 12 boxes the night before his own wedding. What was in the box? Alka-Seltzer tablets. When added to vases filled with oil and water, the fizzy tablets turned the vases into mini lava lamps. The boxes also contained coins which were redeemable for Hawaiian Leis. Click past the break to see the boxes in action on [Nathan] and [Jessica’s] big day and if you’re looking to build a fleet of hardware for your own wedding, take a look at the centerpieces [Bill Porter] created a couple of years ago. The US Navy is working on a few railgun projects that will eventually replace the largest guns on the fleet’s cruisers and destroyers. These rail guns will fire a projectile away from the ship at around Mach 7 on a ballistic trajectory to a target one hundred miles away. It’s an even more impressive piece of artillery than a gun with a nuclear warhead, and someday, it will be real. Until then, we’ll have to settle with [Zebralemur]’s DIY mobile railgun. He built this railgun capable of firing aluminum projectiles through pumpkins, cellphones, and into car doors and blocks of ballistics gelatin. All rail guns need a place to store energy, and in all cases this is a gigantic bank of capacitors. For this project, [Zebralemur] is using fifty-six, 400 Volt, 6000 microfarad caps. The MSRP for these caps would be about $50,000 total, but somehow – probably a surplus store – [Zebralemur] picked them up for $2,400. These caps are just the power supply for the rail gun, and aren’t part of the structure of this already large, 250 pound gun. Luckily, with the seats down in [Zebralemur]’s car, they fit in the back of his hatchback. These caps are charged by a bunch of 9V batteries stuck end to end. When the caps are charged, all the power is dumped into two copper bars in the gun, accelerating the aluminum projectile to speeds fast enough to kill. It’s an incredible build, but something that should not be attempted by anyone. Although this does seem to be the year that all danger seekers are busting out their electromagnetic projection flingers. Over on Hackaday.io, there’s an unofficial contest to cram as much electronics and awesome as possible into a single square inch of PCB. While the measurement system is logical, the Internet is not: it feeds on cats and is entertained by rainbows. [Radomir]’s project feeds into this bizarre fixation with the Nyan Board, a Pop Tart cat that poops rainbows, all the while playing bleeps and boops that would fit well in a Nintendo game. [Radomir] built this square inch of twee for the square inch project, an unofficial contest to fit the coolest project on a 1×1 inch square PCB. Prizes are credits for the Hackaday Store and OSHPark. This entry uses an ATtiny85 microcontroller, a few resistors, LEDs, and a buzzer to play the strange, syncopated Nyan theme song. Power is delivered over a colorful ribbon cable that emulates the rainbow tail of the Pop Tart cat. This isn’t the only project in the Square Inch Project, or even the most blinky; there’s also a RRROYYYYgYgGGBgBPW LED, a square inch quadcopter, and a device that detects the world’s smallest bat. All very interesting projects, and we can’t wait to see all the entries finished. We’ve seen them before. The pixel-perfect Portal 2 replica, the Iron Man Arc Reactor, the Jedi Lightsaber. With the rise of shared knowledge via the internet, we can finally take a peek into a world hidden behind garage doors, basements, and commandeered coffee tables strewn with nuts, bolts, and other scraps. That world is prop-making. As fab equipment like 3D printers and laser cutters start to spill into the hands of more people, fellow DIY enthusiasts have developed effective workflows and corresponding software tools to lighten their loads. I figured I’d take a brief look at a few software tools that can open the possibilities for folks at home to don the respirator and goggles and start churning out props. Last year marked the first-ever Hackaday Prize, where we challenged you to build a connected device so compelling that we’d send you to space. We awarded the Prize at a party following a day-long, multi-track hackathon in Munich, Germany. A great time was had by all. This year, the Hackaday Prize itself is even bigger, the challenge even more ambitious, and the festivities are going to be even grander. So come join us in San Francisco this coming Saturday as we award the 2015 Hackaday Prize and throw a (free) prize party to celebrate! 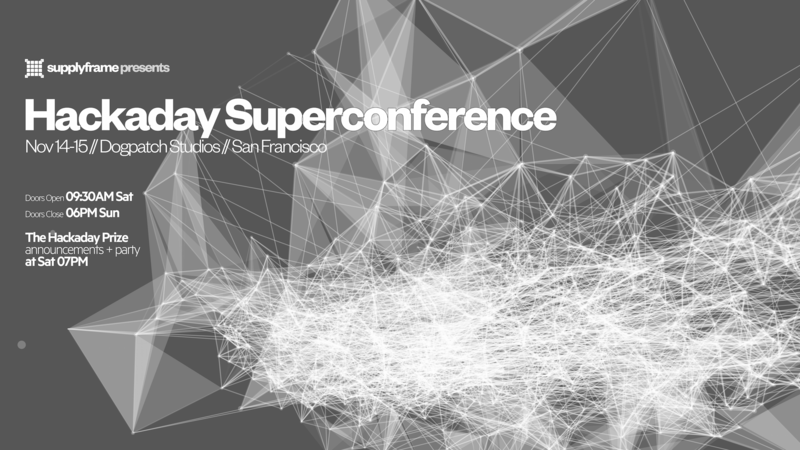 The awards will be part of the first-ever Hackaday SuperConference. We’re bringing together the best minds in hardware hacking and there’s a place for you. The conference will be packed with hardware workshops, talks, food, and fun. (Don’t delay — you have three more days to buy a SuperConference ticket before prices double.) The super-charged scheduled of events have just been published. Directly after the SuperConference, we’re opening the doors to everyone at 5:30pm — whether you’re attending the conference or not — for the presentation ceremony followed by the Hackaday Prize Party. Many of our judges will be on hand to present the prizes and to socialize afterward: Elecia White, Lenore Edman, Windell Oskay, Ben Krasnow and Peter Dokter. Get your free Awards Ceremony ticket now! As you know, the grand prize is a Trip to Space for the project most likely to help solve some of our hardest challenges. Come cheer for your favorite! Because we had so many polished projects last year, we’ve also expanded the Hackaday Prize in 2015 to include a Best Product award. Seven of the ten finalists will be on hand to find out who will go away with $100,000 in cash and a residency at the Supplyframe Design Lab in Pasadena. It’s going to be an exciting night. Dinner is included with this free event, there will be a cash bar, and the music and festivities will carry on until 10:30pm. Please RSVP to help us plan the dinner arrangements. See you on Saturday! Who Is Responsible When Machines Kill? This morning I want you to join me in thinking a few paces into the future. This mechanism let’s us discuss some hard questions about automation technology. I’m not talking about thermostats, porch lights, and coffee makers. The things that we really need to think about are the machines that can cause harm. Like self-driving cars. Recently we looked at the ethics behind decisions made by those cars, but this is really just the tip of the iceberg. A large chunk of technology is driven by military research (the Internet, the space race, bipedal robotics, even autonomous vehicles through the DARPA Grand Challenge). It’s easy to imagine that some of the first sticky ethical questions will come from military autonomy and unfortunate accidents.